Fiber-reinforced polymer (FRP) systems are simply defined as high-strength and lightweight reinforcements created by combining carbon (CFRP) or E-glass fibers with a polymer material. The performance characteristics of FRP strengthening have become increasingly popular in construction and retrofit applications, specifically in aging, damaged or overloaded concrete structures. Steel plate bonding, concrete section enlargement and steel jacketing have been the renovation methods of choice for decades, yet corrosion, bond degradation and installation difficulty, time, and cost are consistent challenges to overcome, and the resultant retrofit generally adds weight, reduces usable space, clearance, or both. The primary benefit of FRP systems versus traditional retrofit methods is that significant flexural, axial or shear strength gains can be realized with an easy-to-apply composite that does not add significant weight or mass to the structure. Many times it is the most economical choice given the reduced prep and labor costs and may be installed without taking the structure out of service. 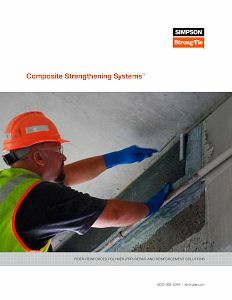 Composite Strengthening Systems may be used to increase the strength of slabs, slab openings, beams, walls, new wall openings, columns, silos, chimneys, piles and pier caps. FRP may be applied to strengthen reinforced concrete and pre-stressed/post-tensioned concrete, steel, masonry and timber. Leverage our expertise to help with your fiber reinforced polymer strengthening designs. Our experienced technical representatives and licensed professional engineers provide complimentary design services and field support – serving as your partner during the entire project cycle. FRP contractors count on reliable manufacturing sources for their projects. Simpson Strong-Tie's manufacturing capacity means fast turnaround time of FRP and FRP-related materials for projects. For complete information regarding specific products suitable to your unique situation or condition, contact us or call (800) 999-5099 to speak with a local technical representative or engineer. In this free webinar series we dive into some very important considerations including the latest industry standards, material properties and key governing limits when designing with FRP. Contractors need an edge in the highly competitive restoration market. The Simpson Strong-Tie Certified Restoration Contractor Network provides valuable tools and benefits to help you grow and enhance your business.